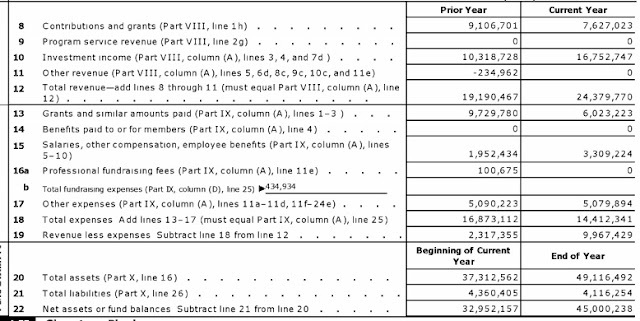 $9,106,701 of which came from Contributions. 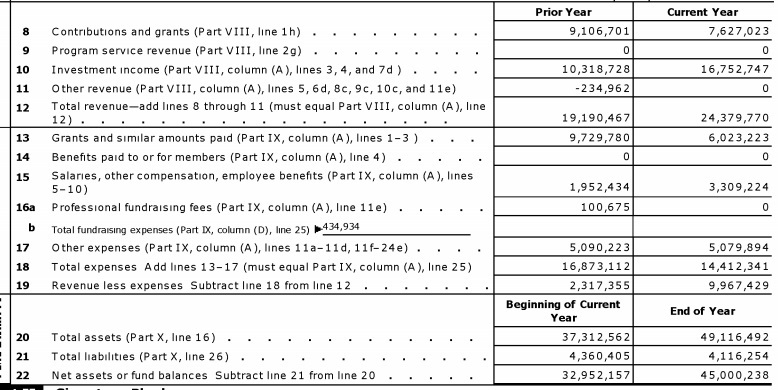 without considering when the $9,106,701 of Contributions came in. In 2012, "The S&P 500 gained 13.4%, marking the benchmark U.S. index's largest annual return since 2009 and fourth-largest return in the last decade. The Nasdaq Composite Index was up nearly 16%. That's a vast improvement from a year ago, when the tech-heavy index fell 1.8%." George Weiss is either a genius investor or he's running a ponzi scheme. $7,627,023 of which came from Contributions. 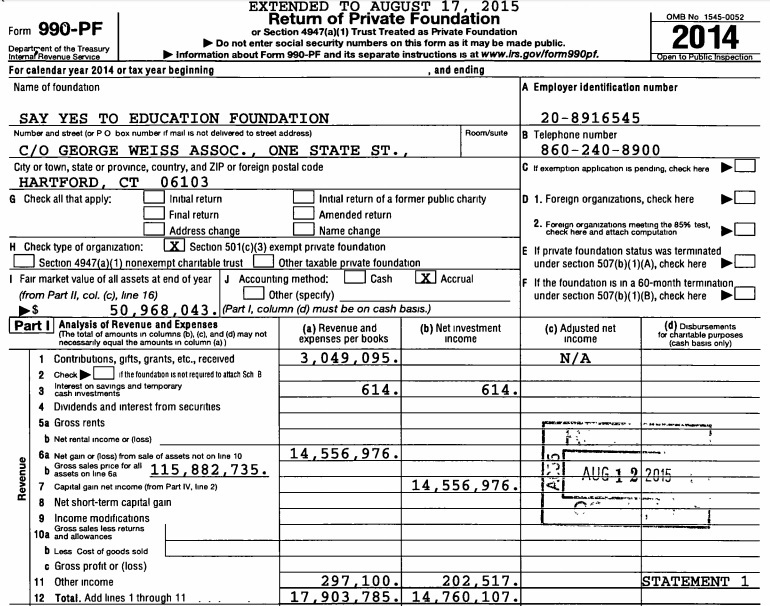 without considering when the $7,627,023 of Contributions came in. a yearly advance of 38.2 percent, and its best year since 2009." George Weiss, whose Say Yes to Education funds are located down south, beat the markets by more than most for two consecutive years without any fanfare. without considering when the $3,049,095 Contribution came in. George Weiss outperformed the stock market by about 25%. 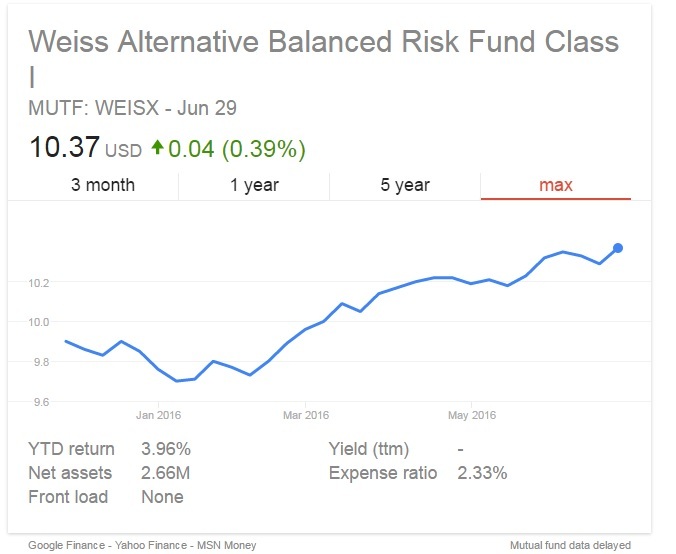 Weiss Multi-Strategy Advisers LLC originally only employed a utility focused long/short equity, but over the years it has broadened its efforts and now manages more than 10 distinct strategies. The firm deploys capital across a number of strategies that invest in multiple asset classes using either a bottom-up stock selection, macro-based or systematic investment approach. The firm places an emphasis on diversification, preservation of capital, consistency of returns and liquidity. consistency of returns and liquidity" outperform like Say Yes' money? The firm's flagship hedge fund is the Weiss Multi-Strategy Partners LLC fund. Beyond serving as the firm's President, George Weiss is well known as the founder of the 'Say Yes to Education program,' which combines academic support and intervention with an offer to pay college tuition or vocational training costs for inner city students. Overall, Weiss Multi-Strategy Advisers has more than 125 employees with its investment team based in Manhattan and an additional office in Hartford, CT. In addition to investment management, the firm offers brokerage services to its clients, including banks and insurance companies." Wednesday, June 29, 2016; WEDNESDAY, JULY 29TH 2015; "The Say Yes to Education program has closed its Syracuse office"